Reading labels is so important in our lives and our pets’ lives. It’s not about the front of the package or a brand’s advertising campaigns. In the case of pet grooming products, you may see a lot of pet grooming brands state things such as, “no artificial fragrance,” “no sulfates,” “no parabens,” “no polysorbates,” or similar claims. Those are all great things to avoid in a dog or cat grooming product. However, that doesn’t mean the product doesn’t include another ingredient you should avoid. It’s about reading the ingredient panel. If I’m purchasing a product for my pet that has ingredients (pet food, grooming products, pet dental products, etc.) the very first thing I do is flip over the product and read the ENTIRE ingredient panel. I need to know exactly what’s inside a product, so I can make my determination if it’s a product I feel safe and comfortable using with Dexter or Nutter. If there is not an ingredient panel, back on the shelf it goes! I’m not a chemist, nor do I expect a pet parent to understand what they are reading on a pet product label. However, that doesn’t mean I’m off the hook at figuring it all out. My pets count on me to find the answers and to make the safest decisions for them. The Internet is your friend! When I’m looking at a new grooming product, the first place I visit is The Environmental Working Group’s Skin Deep Cosmetics Database website. They have an amazing search function where you can input an ingredient hit search, and it will provide you with a summary of the ingredient and a safety rating. For the most part, EWG’s database provides me with all the information I need to make my decision. However, if an ingredient does not turn up any results, my next step is a general Internet search. I tend to type the ingredient name then “side effects” or “toxicity” and read up on the ingredient. Polyethylene Glycol (PEG)-Links to cancer, stomach disorder, loss of memory, and immune dysfunction. Polysorbates (20, 40, 60, 80)-Organ system toxicity, commonly contaminated with the cancer-causing 1,4-dioxane. Propylene Glycol- Liver and kidney toxin, skin irritant (skin, eyes, lungs), contact dermatitis, and organ system toxicity. Sulfates (Sodium Lauryl Sulfate, Sodium Laureth Sulfate, Ammonium Lauryl Sulfate, Ammonium Laureth Sulfate, Sodium Coco Sulfate, TEA, Lauryl Sulfate, MEA)-Organ system toxicity, skin irritations, may be contaminated with 1,4-dioxane. Parabens- Preservatives that are known endocrine disrupters; elevated estrogens can cause cancers of the uterus, bladder, and breast. Now, remember, those listed above are just my top 5. There tend to be more harmful ingredients used vs. good ingredients, so don’t forget to read the entire label. When it comes to toxic grooming ingredients, there really isn’t a reason they need to be inside my pet’s product. There are enough pet grooming products that are truly nontoxic that I don’t see the need to use unnecessary and potentially harmful chemicals on my pets. 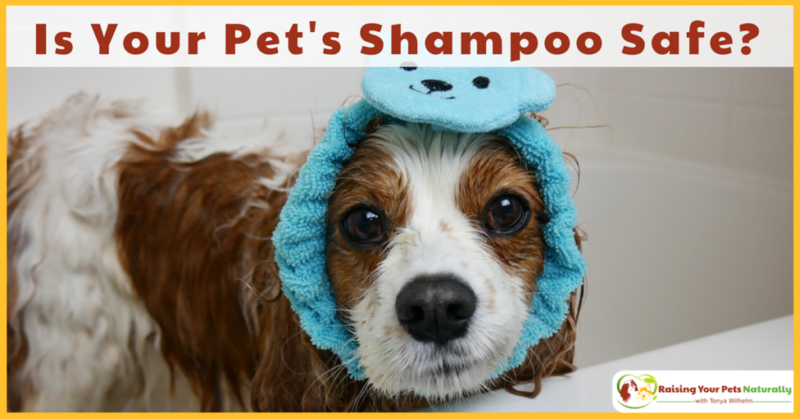 I know you want to hop over to EWG’s database and start with the first ingredient on your pet’s shampoo and work your way all the way down the list. Did you find any ingredients that weren’t in the green? If so, check out 4-Legger’s line of organic pet grooming products. Your pet will thank you. Order today with promo code RaiseNaturally20 for 20% off your first order. 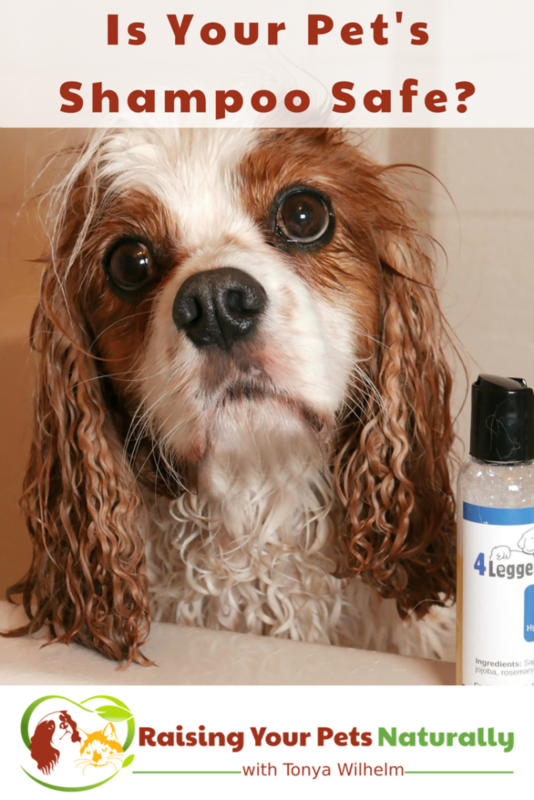 Give Your Dog A Healthy Bath with 4-Legger-The ingredients you use on your dog’s skin is just as important as the quality of food they eat. Clean all natural ingredients aren’t just a trend, they are essential for your dog’s long term health. 4-Legger’s dog shampoos are so natural they are USDA Certified to Organic Food Standards! How often does your dog get bathed? Tell me in the comments. It’s good to know what to avoid. Those chemicals have some serious side effects! Safe ingredients should always be a priority. Yes. It’s a shame that brands feel the need to add so many harmful ingredients when there are plenty of safe alternatives. I think my dog’s shampoo has been irritating her skin. I think I will give this a try and throw the other out. I’m working to make sure our family is using the safest products, and that includes our pets. It makes things so much easier when you find brands you know you can trust. It’s crazy some of the ingredients in things like shampoo!!! My moms cat was allergic to a flea collar once. It really is! So scary. Yes, traditional flea collars and flea products are just full of pesticides and chemicals. Not something I would want on our in my pet. Glad to hear there are non toxic alternatives out there for folk who want to wash their pets. I’ll keep this in mind if we ever get a dog! I have switched many of our family’s personal care products to as close to natural based as possible. I’ve even started to switch our furry family members over as well. We’ve already changed their flea spray over to something that contains more natural ingredients, I’ll be looking into finding a natural shampoo next. I never really think of this and it’s super important to! My husband usually deals with our pet products so I will be letting him know what to watch for! Thanks for sharing with your husband. It’s crazy that pet and people products are allowed to contain so many harmful ingredients. What a great post and super helpful. I’ve actually never researched my dogs shampoo and now I am going to look into this! I’ll have to share this with my dog lovers. Especially the list of things to avoid when it comes to their shampoo. So glad there are safe and non-toxic shampoo for dogs! Thank, you for sharing. Very scary stuff and all these bad ingredients are also in our shampoo, so check your label too.